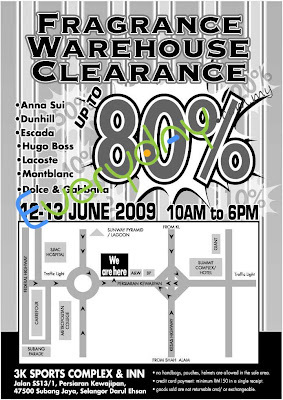 Guess which long awaited warehouse sale that is always at 3k Compleks in Subang Jaya is back? I'm so going! YAYY YIPPEE..omg.. have to save money!!! OMG!!!! I have to go!!! It's nearby my office n my house!!! Miu, u know how to get there? I come fetch you then we go together. how is that? huh....i boleh tumpang miu beli kah if miu ade pigi ? june...i kena duduk rumah "zhuo yue"
wah, sayang, going 4 get anna sui ke ? i'm more into D & G liao....mayb i tumpang u, ok ? hows ur condo ? fixed de wiring ? can you tell me the nearest lrt or komuter from dis place?? nearest ktm is subang jaya ktm station but it's quite far from this place.. u still need taxi to here.